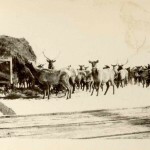 For thousands of years, Elk herds migrated through Jackson Hole on their way to winter ranges in the Red Desert, Green River drainage, Big Horn Basin and Teton Valley. 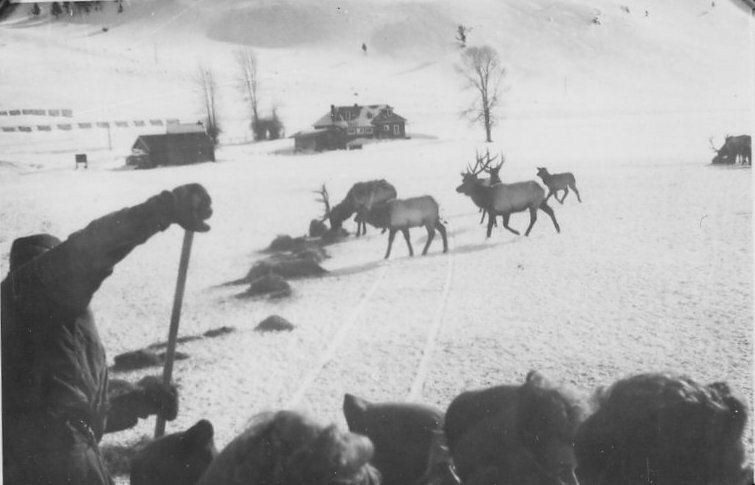 As settlements in these areas expanded in the late 1800’s, the traditional elk feeding grounds were replaced with cultivated fields and pastures. 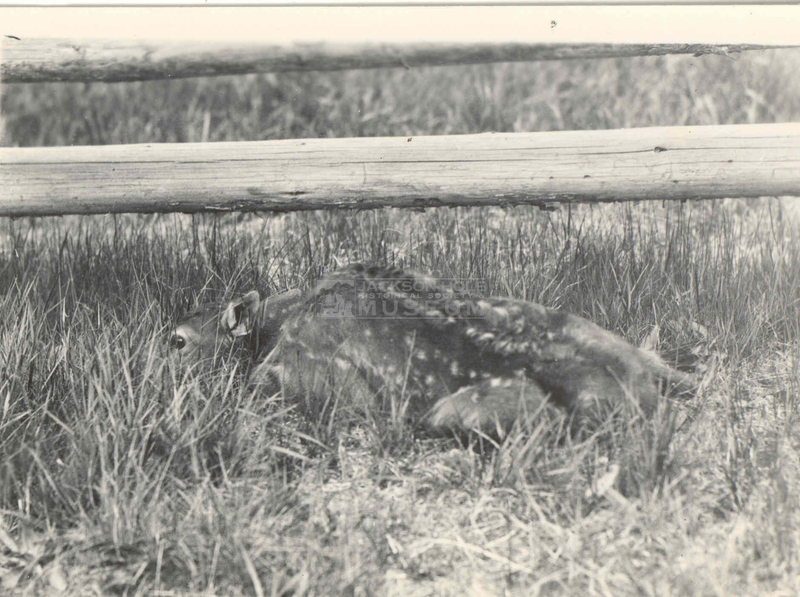 Their migration routes were disrupted by wire fences and wholesale slaughter from indiscriminant hunting. 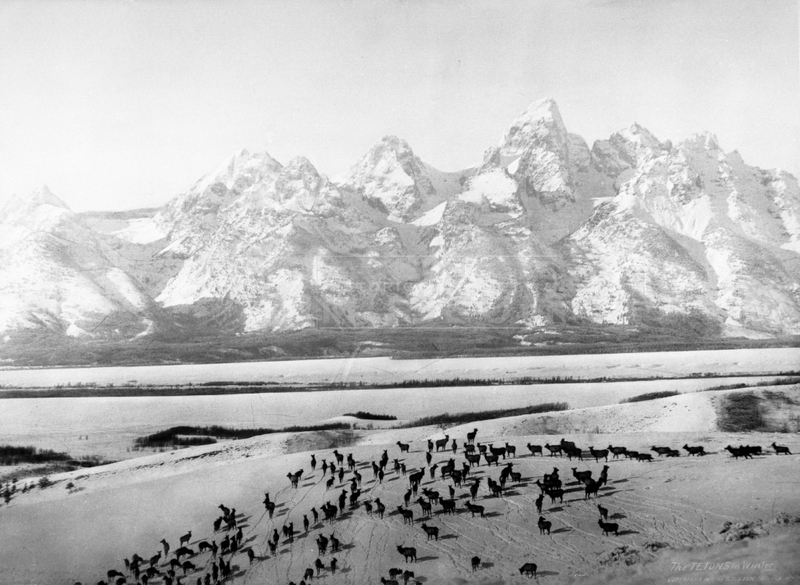 Hemmed in on all sides, the elk gradually ceased to migrate beyond Jackson Hole. 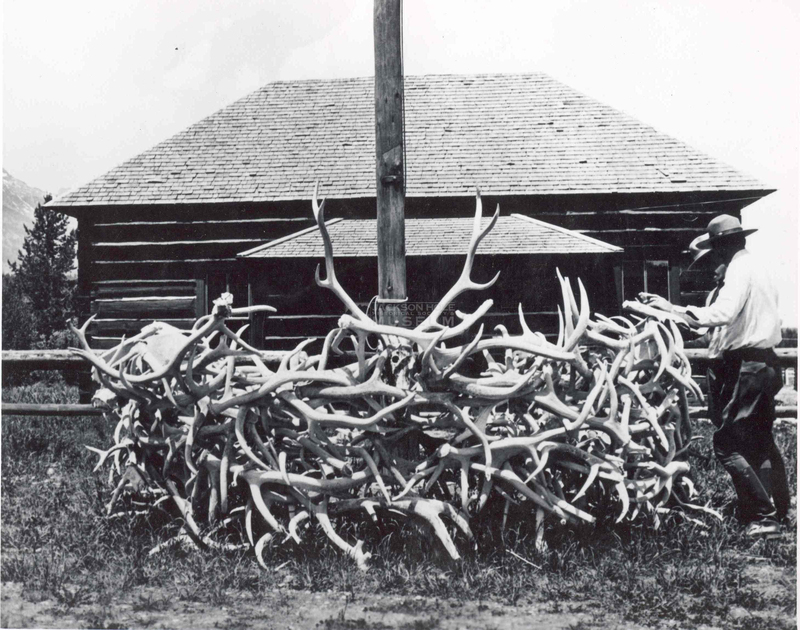 In harsh winters, elk died in huge numbers. 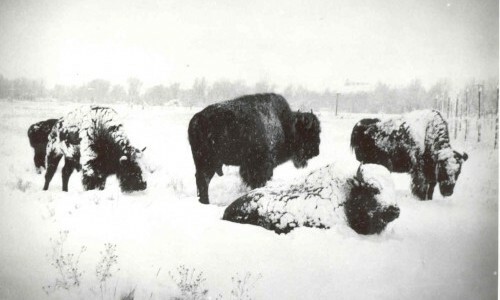 Following several mild winters, the herd reached an estimated 50,000 animals before the harsh winter of 1889-1890. 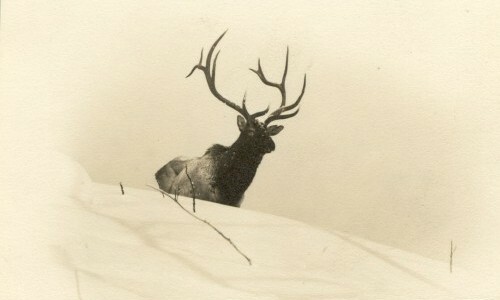 That winter, it was reported as many as 20,000 elk died. 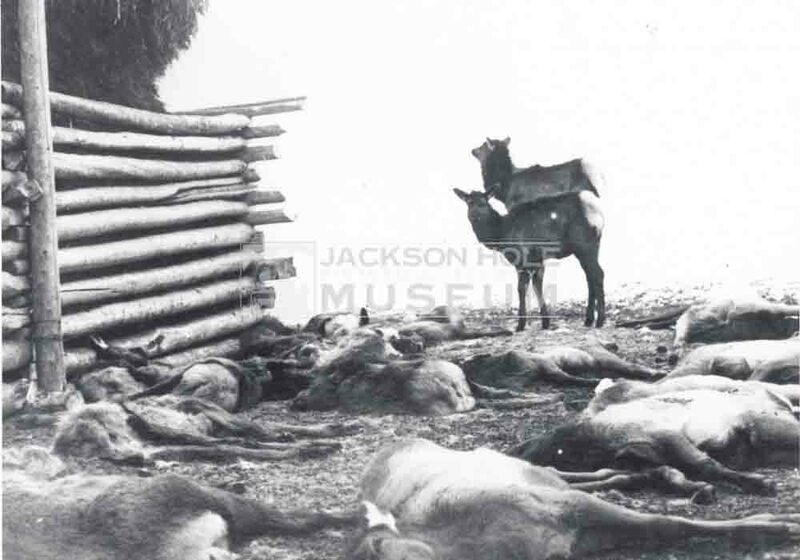 After three hard winters between 1909 and 1911 there were less than 10,000 elk left in Jackson Hole. 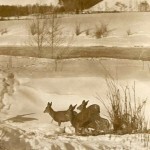 The winter of 1909 was particularly devastating. 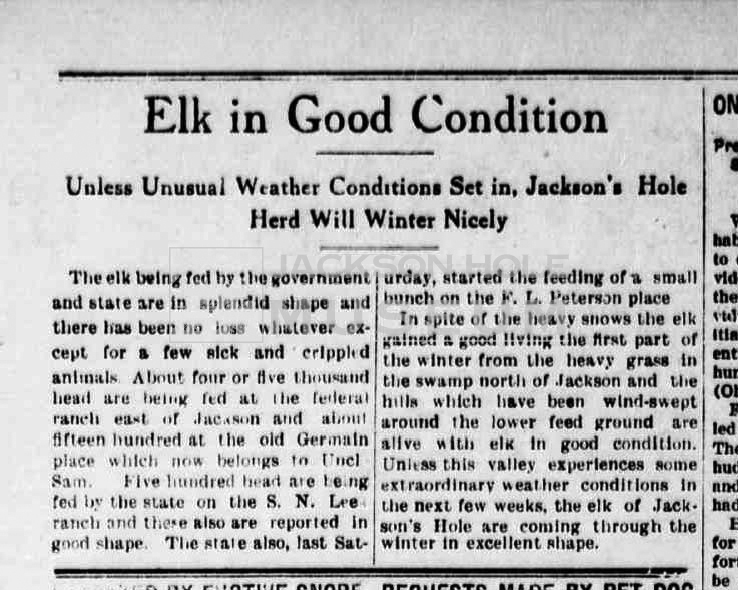 The winter began with heavy snow that drove more than the usual number of elk out of the high country. 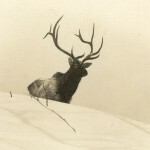 Wet snow turned to rain which then froze making it nearly impossible for the elk to reach food. 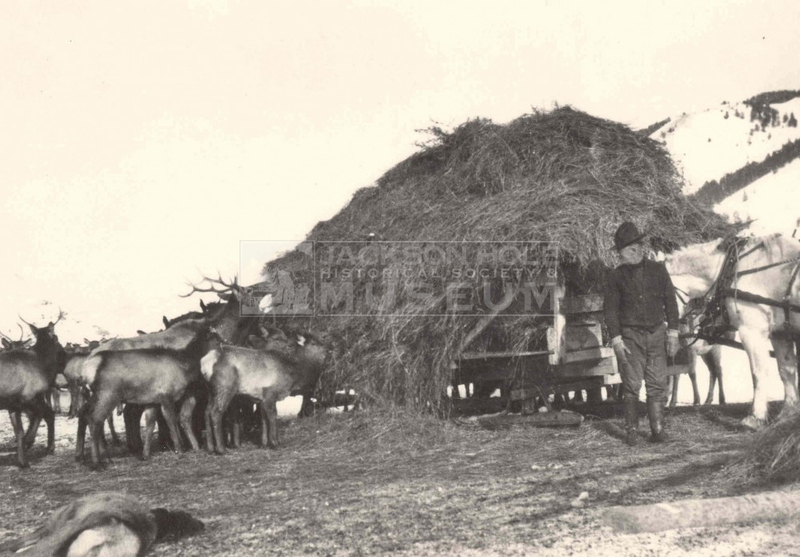 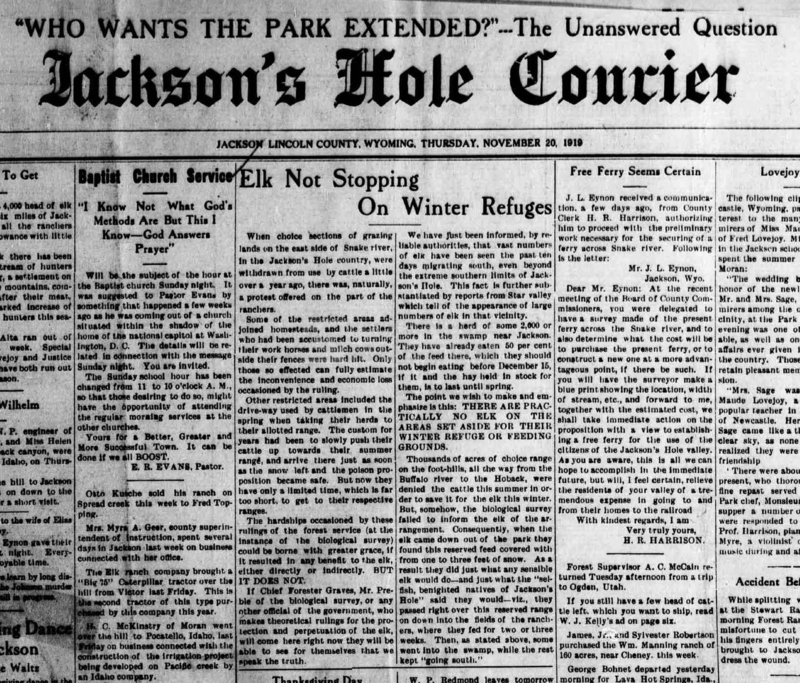 The elk invaded ranches, haystacks and the not yet incorporated town of Jackson. 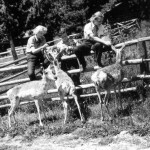 They roamed through the streets and residents’ yards. 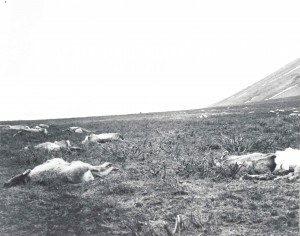 They died everywhere. 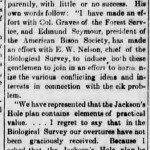 One resident noted in the spring of 1909 that it was possible to walk at least two miles stepping on elk carcasses without ever putting a foot on the ground. 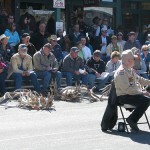 Historian John Daugherty speaking about the settlers relationship to the elk. 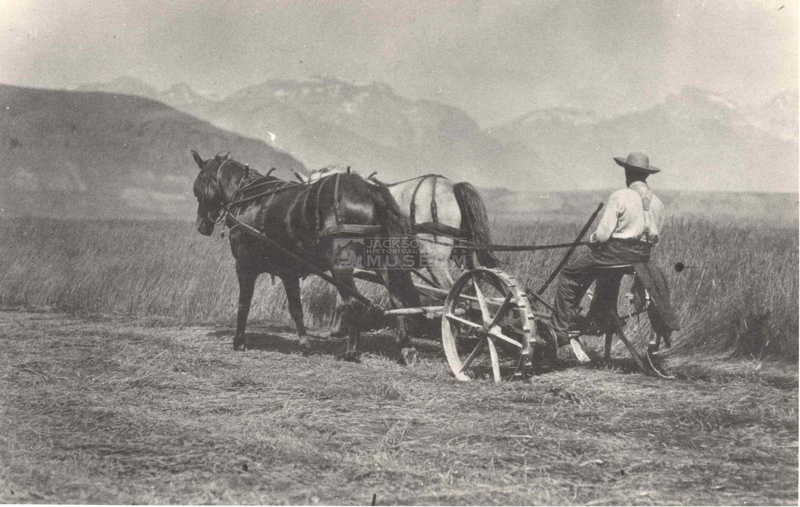 Local Jackson Hole settlers witnessing the carnage in 1909 collected $600 ($15,000 in today’s dollars) to buy hay. 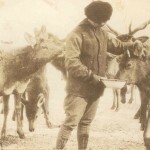 It was the first community effort to feed the elk. 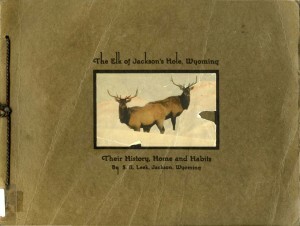 Five districts were established in Jackson Hole with a responsible rancher in charge of each to feed the elk. 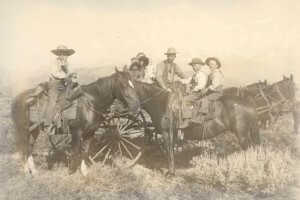 The settlers also petitioned the State of Wyoming for additional funds which were granted in 1910 in the amount of $5,000. 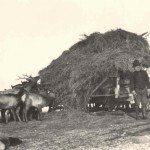 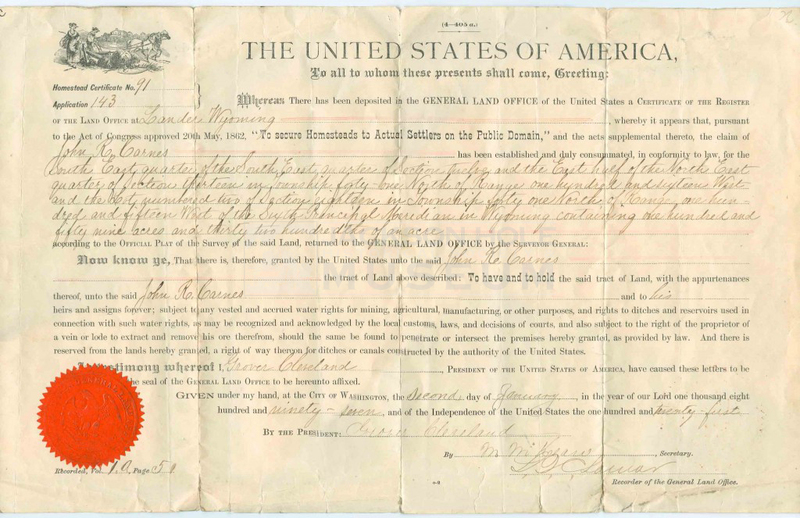 In the meantime, D.C. Nowlin, Game Warden, bought about 400 tons of hay which were distributed to the five districts which stretched 10 miles north of Jackson and 10 miles south. 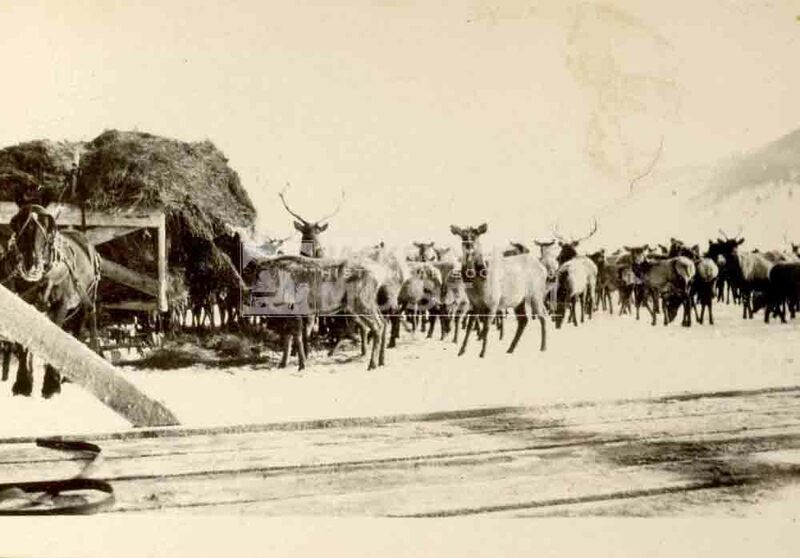 While feeding continued, the available hay was insufficient for the size of the herd. 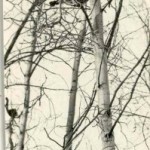 The efforts of S.N. 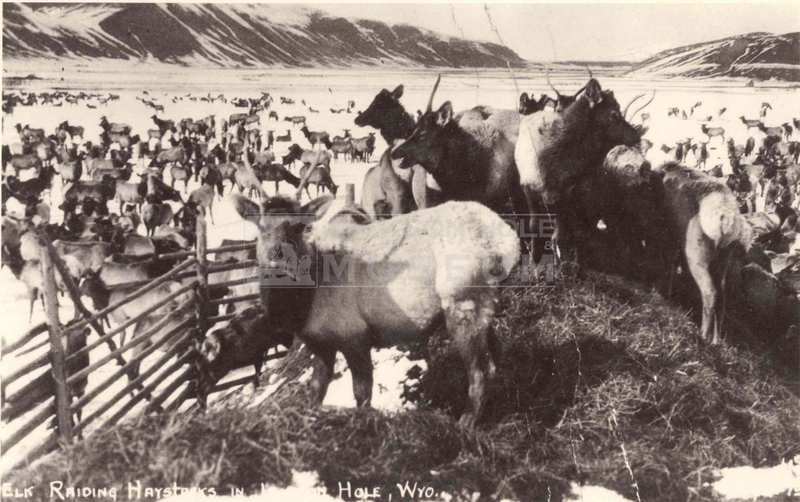 Leek are widely credited with the actual establishment of the Elk Refuge in 1912. 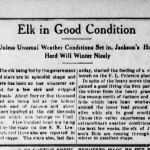 Leek set up a homestead in South Park in 1891 and married Etta Wilson. 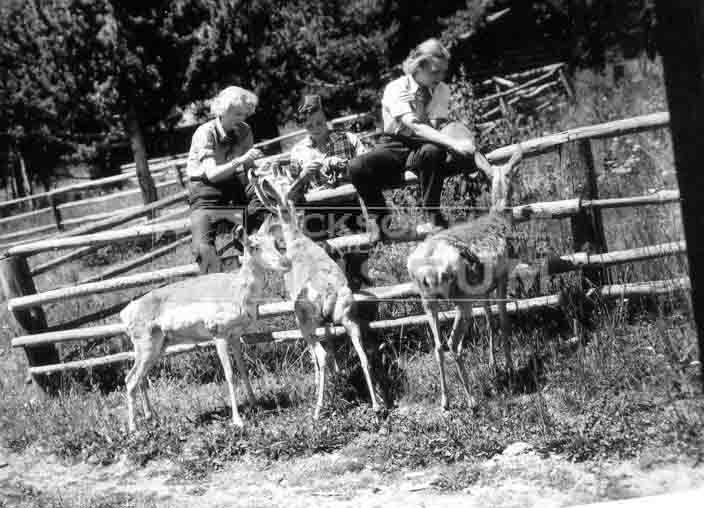 With few employment opportunities at that time, he became a hunting guide. 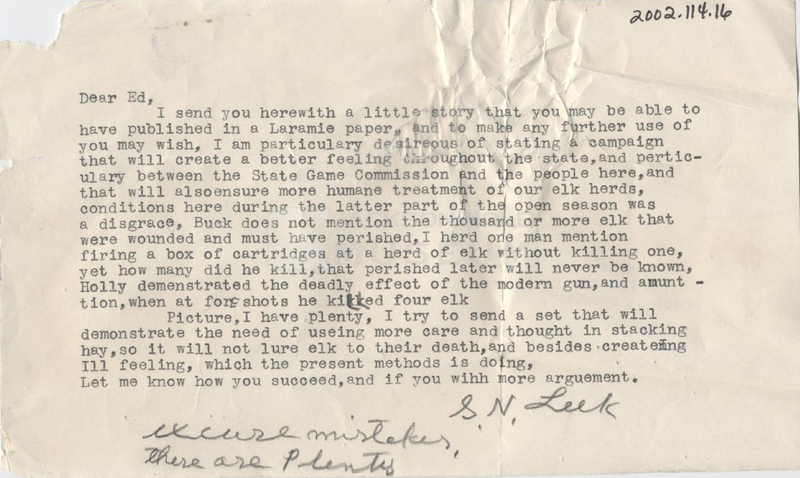 One of his clients was George Eastman, founder of Eastman Kodak, who gave Leek a Kodak view camera during one of Eastman’s many hunting trips in the valley. 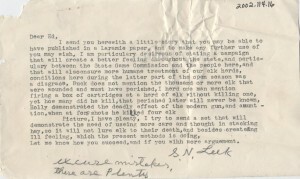 Leek took extensive glass-plate photos of starving and dead elk primarily in the South Park area. 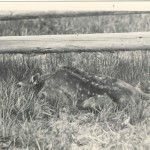 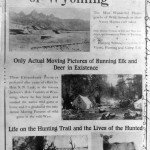 He incorporated these images into articles which he submitted to newspapers and magazines to publicize the plight of the valley’s elk. 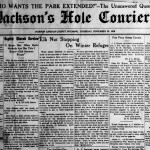 He also embarked on a lecture series around the country to personally emphasize the need for action. 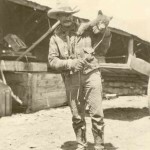 He was billed “The Father of the Elk” on the Orpheum Circuit, a chain of vaudeville and movie theaters where he lectured. 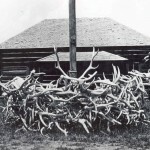 Leek’s writings, photographs and lectures depicting the demise of Jackson Hole elk attracted state and national sympathy and resulted in support from the State of Wyoming, the U.S. Congress and other conservation groups to feed the elk and establish the National Elk Refuge. 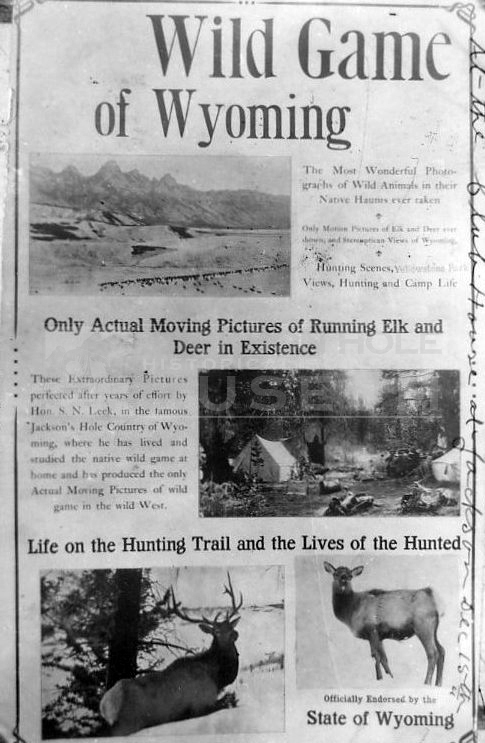 On February 17, 1911, the Wyoming Legislature passed a Memorial requesting the U.S. Congress to cooperate with the State in preserving the elk. 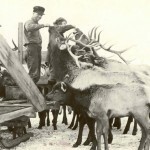 On August 10, 1912, Congress appropriated $45,000 and decreed the creation of a National Elk Refuge. 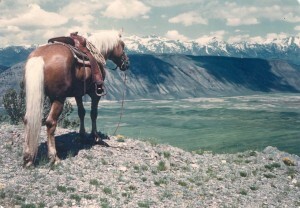 The Government incorporated 1,000 acres of public land and 1,760 acres of purchased land along Flat Creek to constitute the Refuge. 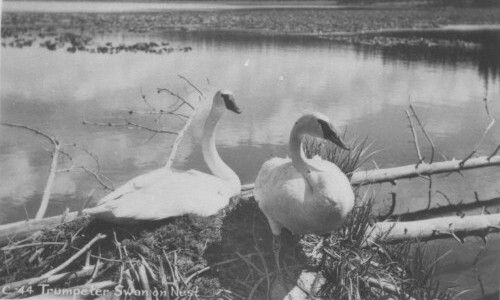 D. C. Nowlin became the first Refuge Manager. 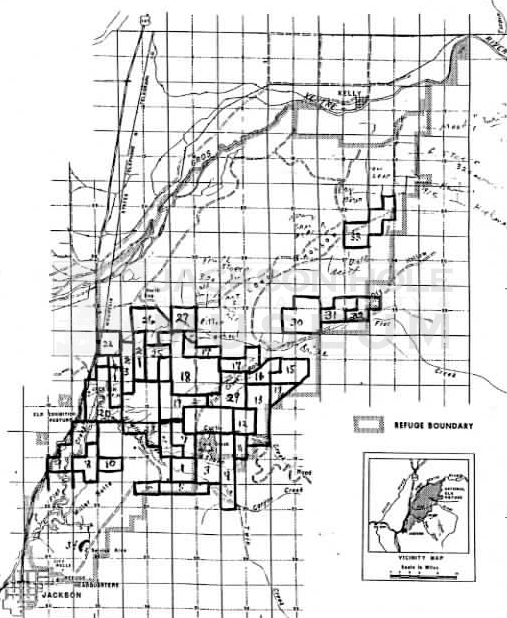 Ultimately, 34 private homesteads were acquired, including the property of John Holland and John Carnes who were the first homesteaders in the valley in 1884. 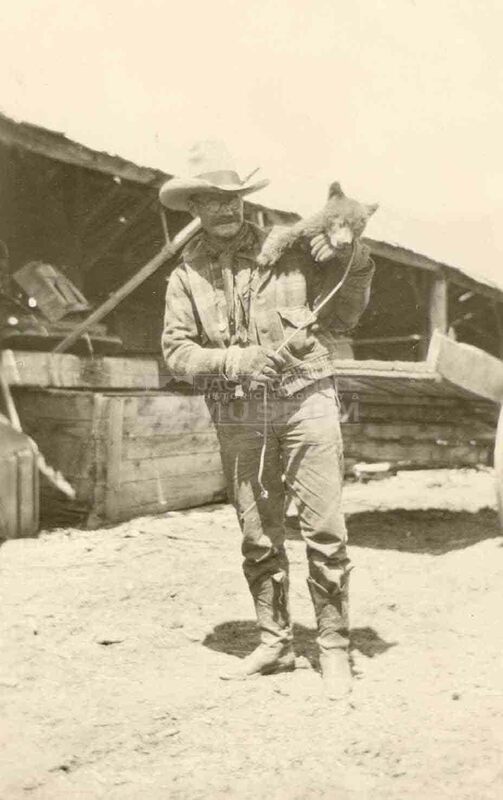 Robert Miller, the third homesteader in the valley, sold his original homestead plus acreage he acquired over time to the Refuge in 1914, a total of 1240 acres. 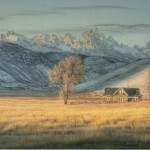 The Miller House still sits on the Refuge and is open to the public. 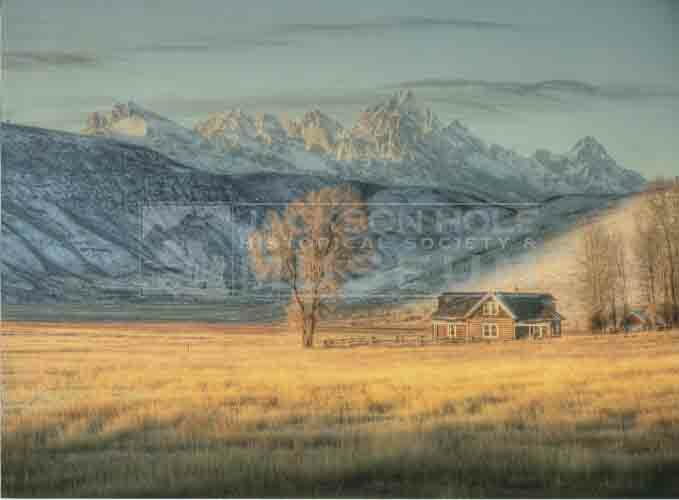 It has been furnished to look as it might have during the Millers’ time. 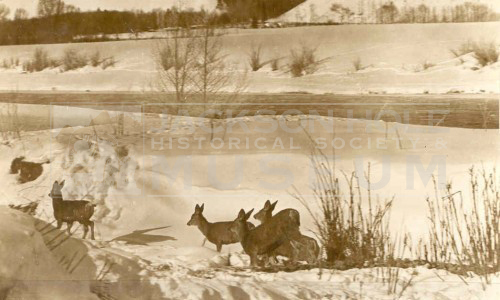 In 1925 the Isaac Walton League of America purchased 1,760 of private land for $36,000 and this addition was accepted by Congress as part of the Refuge in 1927. 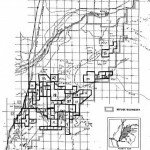 An Act of Congress in 1935 provided 6 million dollars (over 80 million in today’s dollars) for the acquisition of land for wildlife throughout the U.S. A portion of these funds were used to acquire an additional 14,000 acres and negotiations began to acquire just over 3,000 acres from J.D. 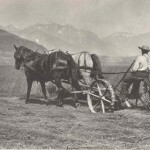 Rockefeller’s Snake River Land Company, which also helped to start Grand Teton National Park. 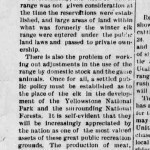 President Roosevelt’s Executive Orders in 1936 and 1937 added 3,165 acres and 618 acres of public land, respectively, to the Refuge. 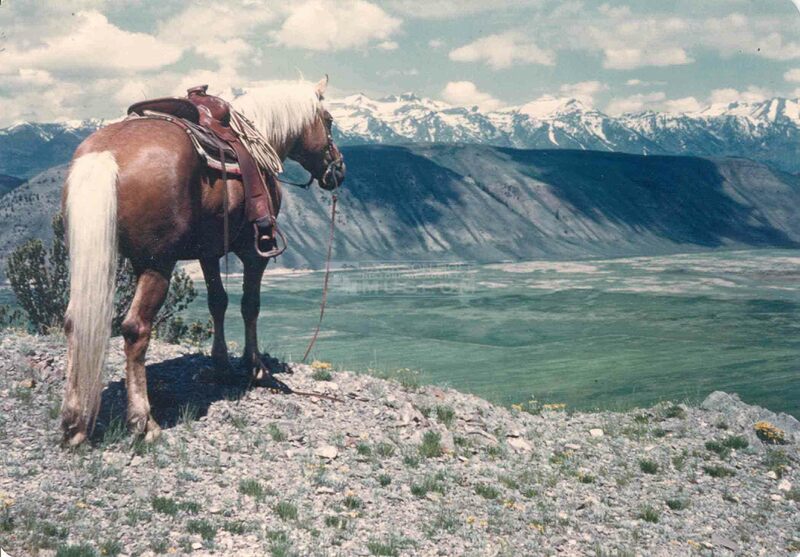 These acquisitions brought the total Refuge to its current size of about 25,000 acres. 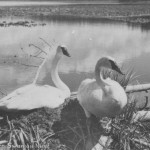 Today, the Refuge is a sanctuary for many other animals including trumpeter swans, geese and ducks. 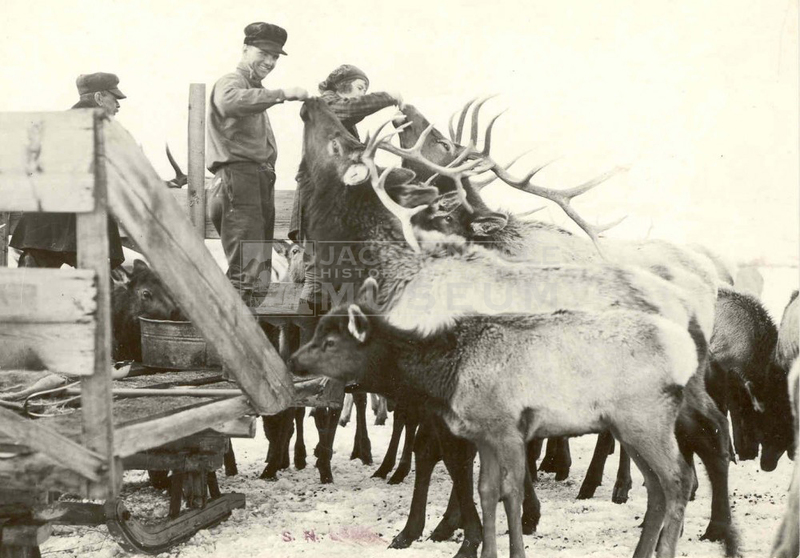 Although activities like feeding wild animals and making them into pets have gone by the wayside, people are still passionate about the controversial act of continuing to feed the elk of Jackson Hole. 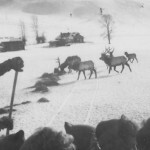 Sleigh rides, hunting and collecting antlers are also considered a benefit and commodity on the Elk Refuge today, mixing business with conservation interests. 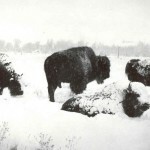 …[it’s] over the science, emotion and economics of protecting these magnificent animals and the landscape they inhabit. 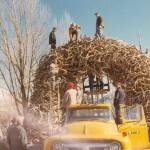 At the center is a critical question: Did human kindness backfire, setting the elk up for disaster? 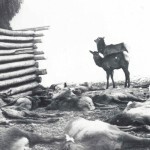 Feeding them could be the death of the elk if disease hits the herd while living on the refuge in such close quarters. 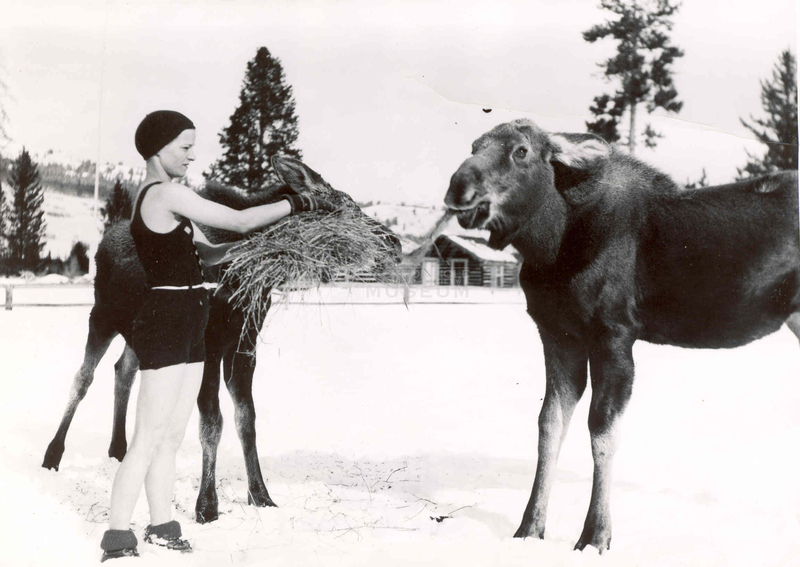 But after a century of training them to be fed by people, disaster potentially looms if the feeding is stopped. 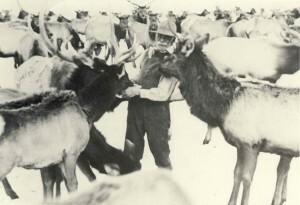 Despite the controversy, the elk and the refuge are integral parts of the community. 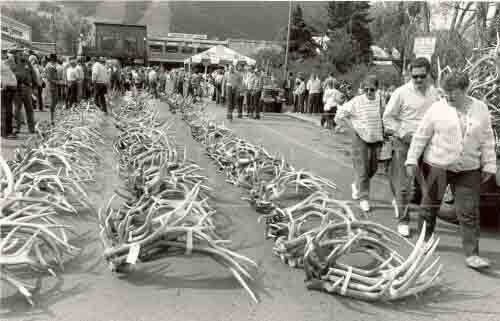 In the spring, annually shed antlers are collected by local boy scouts on the refuge and sold at the Elk Antler auction in downtown Jackson. 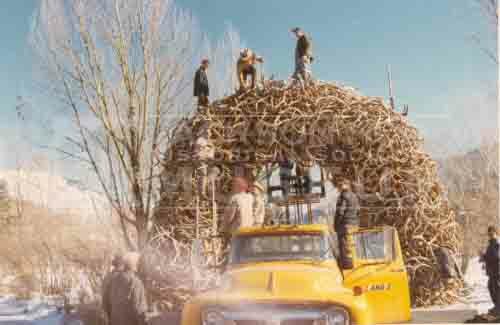 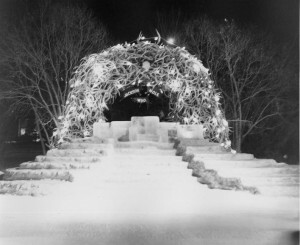 Antlers have long been used as decorative objects, including one of Jackson’s most famous landmarks, the Town Square Antler Arches. 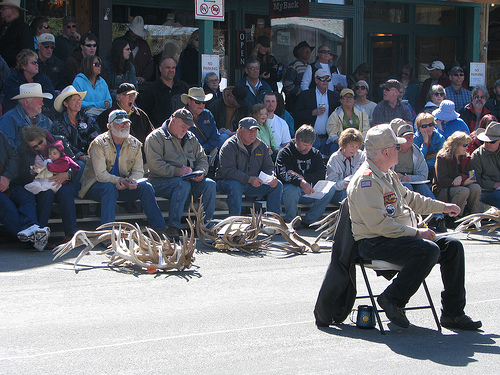 Elk are so much a part of the community’s fabric now that there is a whole weekend, known as ElkFest, devoted to them in May every year. 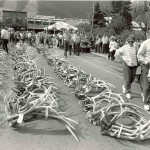 Read about the 2012 ElkFest from the Jackson Hole News and Guide. 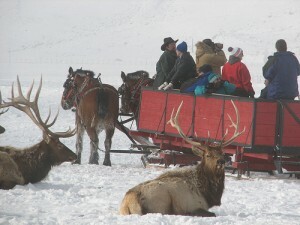 The refuge offers a unique opportunity to have quick access to amazing wildlife experiences like sleigh rides in the winter with the elk, hunting elk and bison in the fall to thin out the herds in an effort to keep disease at bay, and a number of other interactions with the animals. 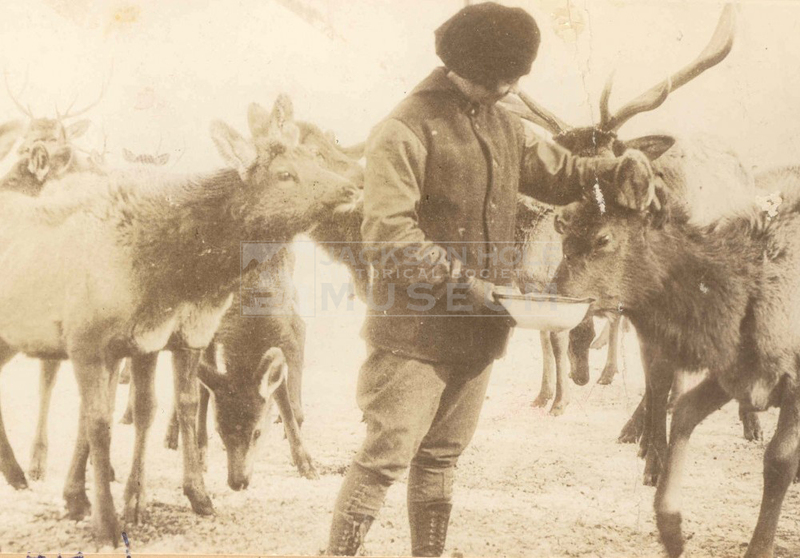 Images selected and text written by Steve Morriss, fabulous Friend of the Museum. Special thanks to the American Heritage Center for allowing the use of images from the Stephen N. Leek Collection. 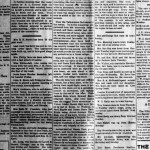 Click here to see more from that collection. All other photos and documents are from the collection of the Jackson Hole Historical Society and Museum.